There are some painting projects where you can get by without first priming the surfaces, but painting new, freshly finished drywall is not one of these. Fresh, bare drywall, where the taped and mudded seams and fastener holes are still exposed, really does require some form of priming before you paint it. Bare wallboard soaks up a lot of paint, and if you don't prepare the surfaces, you may find that you are applying three or even four coats of paint before the mudded seams stop showing through. If you prime the surfaces first, you'll likely make it possible to get by with a one or two coats of paint—especially if you are shrewd enough to tint the primer coat. That said, priming drywall is not a task you need to overthink. There are a number of easy ways to prepare a wallboard surface to accept paint. The reason that new, freshly finished drywall poses a problem is that the surface presents you with three different textures, each with its own rate of absorption. The areas where taped and mudded seams and screw holes have been covered with drywall compound (mud) tend to absorb paint rather greedily. Sanded drywall paper—the paper facing near the mudded seams—has a scuffed, fuzzy surface that also tends to absorb paint vigorously. Finally, the plain paper surfaces where the drywall hasn't been scuffed at all will be relatively smooth and glossy, and these will absorb less paint. The result is that when you paint directly onto bare, finished wallboard, these different rates of absorption will give you a mottled, streaked look where certain areas "flash" through. This unevenness only disappears after multiple layers of expensive paint. Depending on the color and glossiness of the paint, it can sometimes take three or even four coats before the painted surface is uniform. Color is equalized. Primer equalizes base colors of drywall mud and paper so that the paint colors laid over it can truly shine without interference. With newly finished drywall, you will have two base colors: the color of the paper (gray, off-white, or green) and the color of the mud (white or off-white). One coat of primer or even a cheap neutral-colored paint will go a long way towards covering up these colors. A better quality (thicker) drywall primer or a "hiding paint" will cover them up completely. Porosity is equalized. Drywall primer soaks into paper, scuffed paper, and mud—the areas of differing porosity—and creates a uniform surface to which the finish paint can adhere. Have you ever look at a painted wall from a sharp angle and seen the finished joints show through? This is an effect called "joint banding" or "flashing." Drywall primer will reduce or completely eliminate that effect. 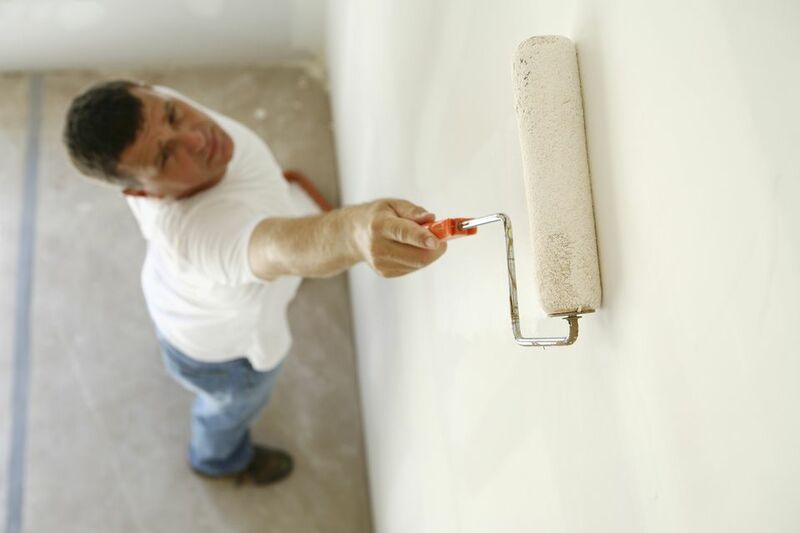 The most common method of priming drywall is to apply a coat of primer-sealer designed for drywall. Different manufacturers make some prideful claims as to why their primers are the best, but essentially they are all pretty much the same. Drywall primer-sealers are simply inexpensive forms of wall paint with a somewhat unusual level of "stickiness." They come in both water-based (latex) forms, as well as oil-based (alkyd) forms. In addition, you can choose between standard sealers, which are appropriate for perfectly smooth and well-finished walls, or high-build primer-sealers that can help fill in rough or uneven drywall finishing. The high-build products cost quite a bit more, but they may be worth the expense, especially if you are preparing a drywall surface that is rough. Fora basic drywall primer-sealer, there is little reason to spend a lot. Even rather inexpensive paint lines will cover quite well over basic, inexpensive primers. You should plan to spend no more than $7 to $15 per gallon of basic primer, no matter how expensive the finish paint will be. High-build primers will cost considerably more—$40 or $50 per gallon is not uncommon. To improve their covering ability, primer-sealers can be tinted before applying, so that the primer coat is a closer match to the color of the finish paint you have chosen. Paint stores may be able to add pigments to the sealer-primer, sometimes for a small additional fee. If you are not a professional drywall installer seeking utter perfection, then flat latex paint is your ticket to inexpensive drywall priming. Even pros sometimes opt for a cheap latex paint as a primer when the surface has been so well finished that the surface is perfectly smooth without flaws. Flat latex paint as a pre-coat does not have all of the virtues as primer-sealers aimed specifically at drywall, but it is good enough to satisfy the needs of most homeowners. Many drywall manufacturers, such as USG, even recommend plain flat latex paint as a viable type of drywall primer. The cost of a gallon of basic flat latex paint is usually considerably less than a top-quality finish paint—perhaps $10 or $15 compared to the $40 or more you might pay for the finish paint. Here, too, you can tint the flat white latex paint to more closely match the finish color, making multiple coats less likely. Products Such As Benjamin Moore's Super Hide takes this concept a step further. This product is still a flat latex paint, but it is slightly thicker and has better color-hiding properties than plain latex paint. There are a lot of "hiding paints" on the market, and any of them will work just as well as Super Hide. Just make sure to choose one that is compatible with raw drywall. Hiding paints may cost twice as much as ordinary flat latex paint, however. Skim-coating is the process of using a drywall taping knife to scrape on, and then immediately scrape off, drywall compound from raw drywall. The remaining compound that your knife cannot scrape off is the skim-coat. This is the fabled Level 5 drywall finishing step that professional installers perform to achieve perfect wall texture. Can you do this? Yes, but it is far easier for the average homeowner to use a roller to apply other types of primer than it is to skim-coat an entire room or several rooms. Skimming with drywall mud is something to try only as a challenge or if you want to hone professional-level skills. Skim-coating walls with drywall compound is an excellent way to prime drywall at a very low cost, but all of that skimming is more work than rolling out paint. First Coat, by USG, takes drywall priming to its logical conclusion. One professional painter characterizes First Coat as a primer that operates just like a skim coat. A gallon costs about $25, roughly the same as a hiding paint. First Coat costs more than flat latex, but it is specially formulated for drywall priming. It contains a vinyl acrylic binder and calcium carbonate filler to equalize surface textures.